Doggone it. 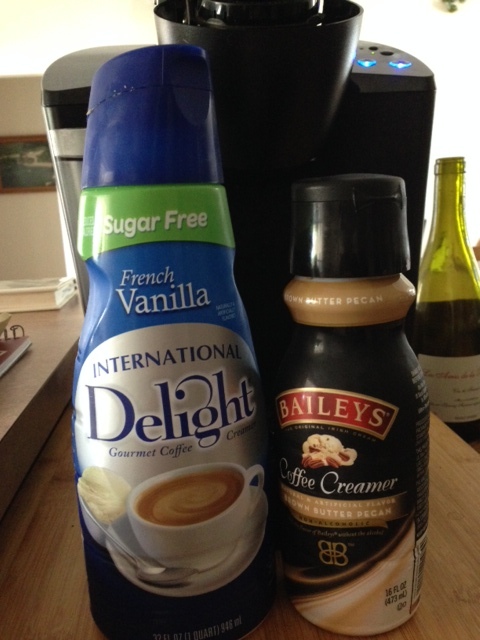 Why do my local grocery stores only carry plain-Jane flavors of coffee creamer? Vanilla, caramel, hazelnut, and a few seasonal concoctions are all that grace our shelves. I know from traveling and a few relevant trade shows that there are dozens of flavors we never see–flavors that appeal to me a whole lot more. So here’s the dilemma. A store might say it is catering to the preferences of its clientele. Customers buy a lot of French vanilla, so they stock French vanilla. But how do customers (or the store) know whether they like cinnamon creme if they don’t even know it exists? We limit ourselves by serving only current needs and desires. We look at what’s around us rather than looking ahead at what could be. Although we think we are meeting demand today, we’re actually limiting it in the long run. There’s a big difference between serving demand and creating it. Forget coffee creamer. The point is that we have to think ahead. Where can we go? What can we accomplish? What new solutions can we offer? What can we do that no one has ever thought of? We move forward by looking beyond our current situation and reaching for more. And lest you think my capitalistic heart has taken over, I’m talking about new ideas, not necessarily new products. Reach for the stars, friends. You might just find a planet. Before I start with the “real” content of this post, I want to say that I am unbelievably proud of my son, who earned his varsity letter for wrestling this year–as a freshman. He worked really, really hard and took at least his fair share of bumps and bruises–to his body and his ego. Talking to my son’s wrestling coach the other day, I asked him his thoughts about the program. As much as he appreciated how hard those boys worked, he lamented the team’s lack of depth. Although there are 14 varsity weight classes, they could only fill 12 of them this season, and several of those spots only had one guy. That is, the guy who got the varsity spot took it by default; he didn’t have to wrestle off or prove he was better than anyone else. Where I come from, said the coach, freshmen and sophomores wouldn’t even be sniffing at the varsity line-up. When I pushed for clarification, he went on to say that underclassmen would be working hard and paying their dues, getting better and stronger in the hope that they would be good enough to earn a varsity spot as a junior or senior. Of course, as the mom of a freshman who had wrestled varsity almost all season, my initial (internal) reaction was to go all mama-bear and protect my son’s accomplishments. The more I thought about it, though, the more I respected the coach’s position. After all, if no one is challenging those boys for their spots–if they don’t have to worry about others rising through the ranks and threatening their hold on them–what’s their incentive to get better? They’re already “good enough,” right? I thought back to some of the opposing teams our kids had faced this year, and the toughest ones always had huge programs. In fact, one team we wrestled even had an A-team and a B-team–both considered varsity–with an even larger number of JV guys hungering for their spots. No wonder they were so good–they just naturally pushed each other upward and onward. I’m not saying our kids didn’t work hard. Oh, they did–they really did–and I’m proud of them all. But I also know that things look different when you can see the forest beyond the trees, and for our guys, that forest was a long way off. No wonder the coach thinks that the secret to the success of the program is to get more kids interested and participating. Some people have an incredible internal drive and push themselves to improve no matter what. Even those people, however, need to see where the bar sits. That’s why when I was running in a lot of races, I not only looked at my time and strove to improve it, but I also looked at the winners’ times to see where I needed to go. Competition can be healthy for all of us. It helps us get better individually and as a team. It doesn’t have to be a zero-sum game with one winner and one loser, either. After all, I might never make varsity but end up vastly better than where I started. Or I might lose my varsity spot to someone who has surpassed my ability–and I have to step it up to get it back. Sure, there’s unhealthy competition, too. But when I look at this kind of situation, how does it make me a loser if I end up better than where I started? I shouldn’t be afraid of more people on “my” turf; I should use them to spur me on. The more the merrier.